One to one studies through the Gospel of John. 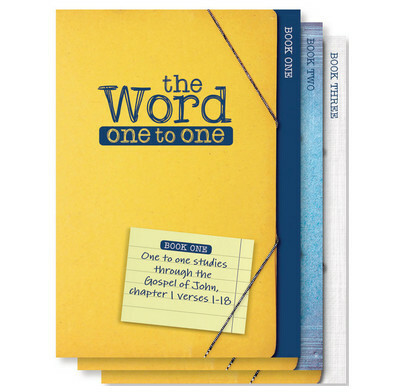 The Word One to One is designed to help you show Jesus to your friends by opening up his Word in the Gospel of John. Each double page has the Bible text on the left, and questions to study, comments and answers on the right. This pack includes two copies of each of the 3 books (one for you and one for a friend) to take you through the first 4 chapters of John's Gospel. You do not need to be used to teaching the Bible, or leading a study, all the explanations are in the notes! This is a wonderful resource. I'm thrilled it is available! Why? Because as you meet with your friend one to one they don't have to say a word unless they want to - instead we present the Word to them. It's genius! This resource is just what I was looking for. I have been reading through it with a much older friend who had not read the Bible before. The dynamic worked really well as I didn't have to ask her questions, which would have felt awkward, given the age difference. We were studying and learning together in a very easy fashion. She keeps saying how wonderful the book is and is thrilled to have got to know the real Jesus. PLEASE can other books of the Bible be put into this format, with the very helpful notes and easy to read format. This is such an easy resource to use. I have used it with two friends from very different backgrounds both have really engaged with it. Everything you need is in the book- no preparation required. Anybody could use these books.